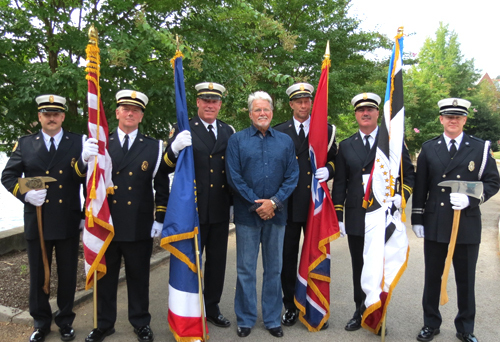 Con was very honored to be invited once again to sing our National Anthem at the 2013 East TN 9/11 Remembrance Ride & Ceremony. This marks the 10th year of the annual event that started in 2004 as a way to honor and remember the victims of 9/11/2001. This also marks Con's third year to sing the National Anthem at the event. 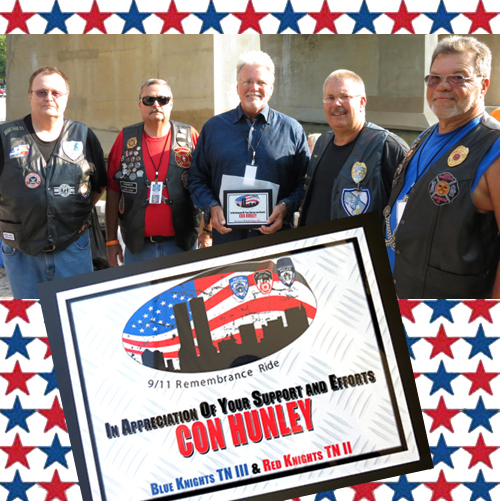 Before the ceremony begins, members of the Tennessee Chapters of the Red Knights and Blue Knights present Con with a plaque showing their appreciation of his participation and support of the Remembrance Ride. Pictured L-R: Norman Rickman, Blue Knight TN III President; Fred Tipton, Red Knight TN II President; Con; T.C. 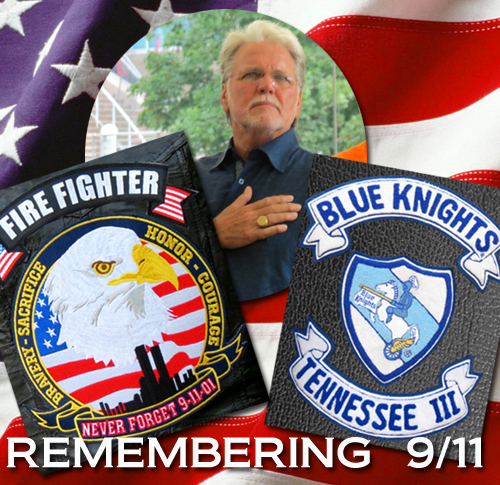 Hicks, Blue Knight TN III Past President; and Greg Darnell, Red Knight TN II Vice President and Past President. 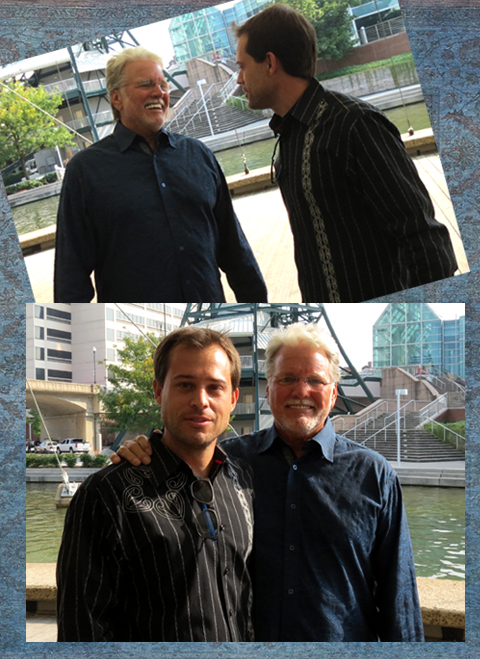 As the crowd pours into the World's Fair Park Amphitheater, Con and Jack Ryan share a few moments. 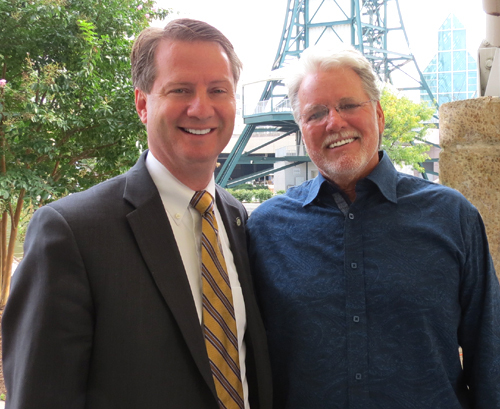 Jack is the emcee for today's event, and is the afternoon drive host at 96.7 Merle FM in Knoxville. 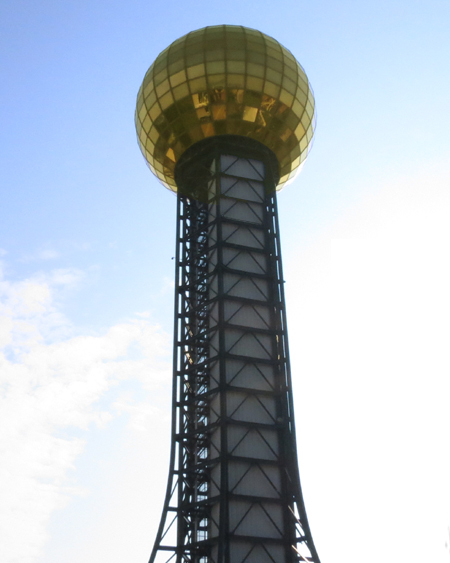 surround Knoxville's iconic Sunsphere at the World's Fair Park. The crowd grows as bikes line every street and alley leading into the World's Fair Park. 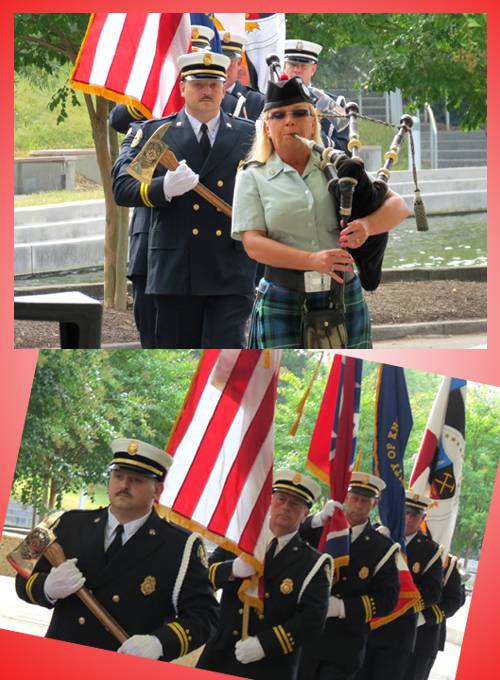 The Color Guard for today's ceremony was made up of members of the Knoxville Fire Department. Tim Burchett, left, is proud to be among today's speakers. Kelly Shipe plays "Amazing Grace" on the bagpipes and leads the Color Guard into the amphitheater as today's ceremony gets underway. Con then sings his soul-stirring version of our National Anthem, The Star Spangled Banner. 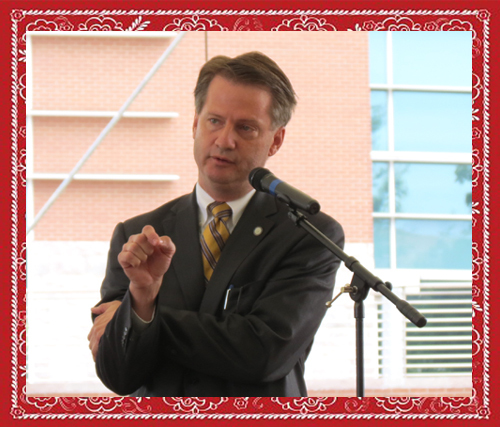 Next, Mayor Burchett addresses the crowd with his thoughts and memories of that tragic day, and how even though we are a nation made up of so many different races, cultures, religions, and political views - that day we all became one. 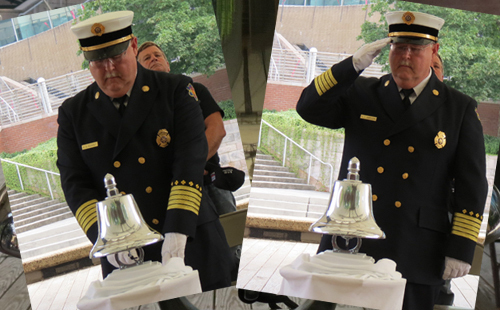 After the Policeman's Prayer and the Firemen's Prayer were read, Oak Ridge Fire Chief Darryl Kerley rang a bell at 10:28am. This is the precise moment that the second tower fell at the World Trade Center in NY on September 11, 2001. 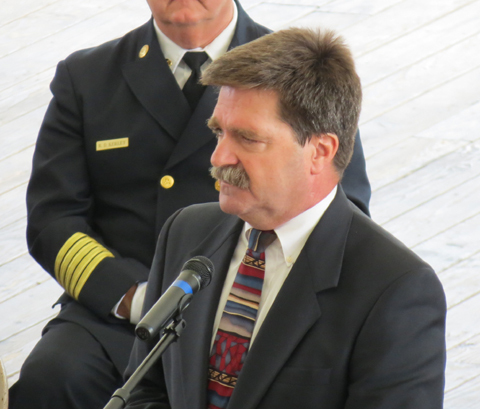 Families of first responders also bear a huge burden as the lives of their loved ones are on the line daily as they attempt to ensure safety and security for others. 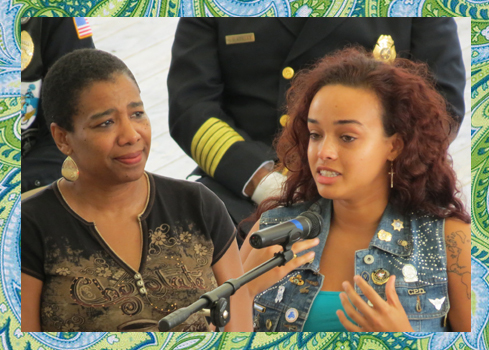 Trina is Past President of Middle & East Tennessee Concerns of Police Survivors. She lost her husband David in the line of duty in 2002. Special Counsel to the Knox County Sheriff's Office, Butch Bryant, spoke next of the continued challenges our officers face as they put forth every effort to keep us safe. After a closing prayer, members of the Knox County Sheriff's Department Honor Guard performed a 21 Gun Salute, and with that the ceremonies drew to a close. 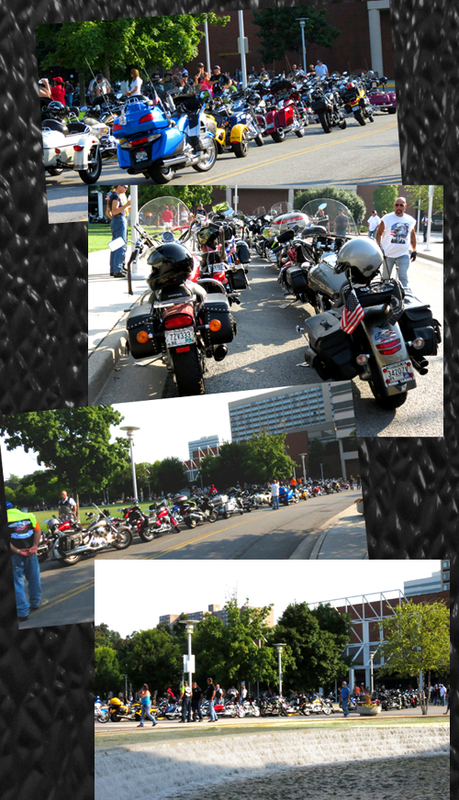 Riders then began to make way to their bikes to get the 2013 Remembrance Ride underway. At left are a few of the clubs represented in this year's Ride. Another year has come and gone since the tragedy of 9-11, but we stand together in our promise that we willnever forget!